This canopy swing of size 90” (Height) X 120” (Width) X 54” (Depth) consists of two sets of pillars one top canopy and a swing seat. The pillars are mounted on an intricately carved base and joined at the top with a pillar section. The pillars have synthetic inlay. The pillar section is carved with a yali design. The canopy is intricately carved on the inside with floral patterns and bordered on the outside with synthetic inlay. The seat is inlaid and carved and can seat upto three individuals. 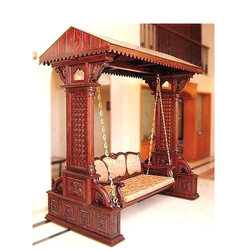 This swing is of size 84” (height) x 84” (width) x 24” (depth) and consists of two pillars a central arch beam and the swing seat. The two pillars are mounted on a base with intricate carving work and the pillars are turned with two corbels on top supporting the main arch beam. The arch beam is part of an auspicious decoration for gods & goddess known as prabhavali. The prabhavali has two demigods on both end and demon in the center known as yalis. Yalis are the protectors of the god and also do their bidding. The swing seat has got a turned backrest and armrest and is suspended from the arch with intricately turned brass chains. 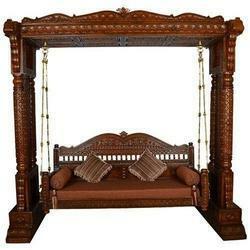 We are the leading and prominent Manufacturer and Exporter of Antique Wooden Furniture. Looking for Wooden Swing ?